Published: December 28th, 2018 by Simon. Filed in Tiles and tagged bathroom tiles, ceramic tiles, floor tiles, Marble Tiles, mosaic tiles, porcelain tiles. When it comes to defining the overall look and feel of a bathroom, your choice of floor tiles plays a huge role. After all, the bathroom is one of the most important and most frequently visited rooms in any home. 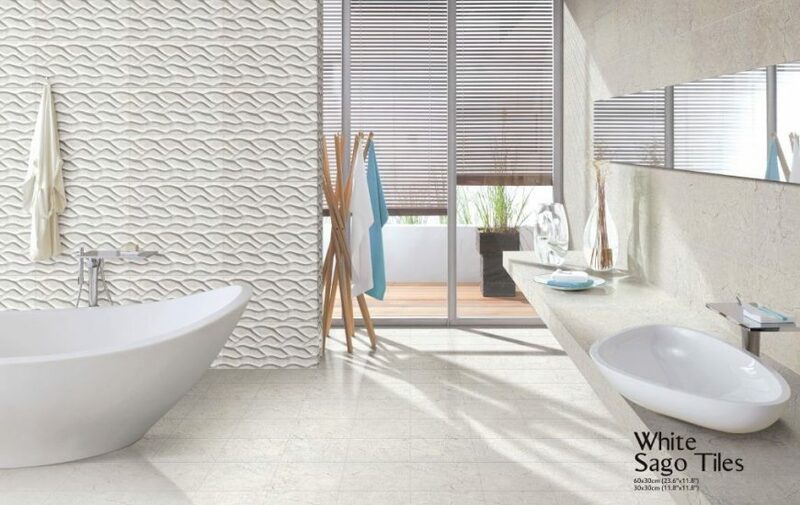 To make an impressive style statement, you need to choose your bathroom tiles carefully. There’s a lot more to buying bathroom floor tiles in Perth than simply finding a colour and pattern that you like. You need to understand that every type of floor tile is designed for intended use and therefore, you must choose floor tiles that are specifically designed for use in bathrooms. As Ross’s Discount Home Centre’s head of purchasing, I know all the considerations needed to choose the right bathroom floor tile. Today, I will share my knowledge with you. So, continue reading this article to discover everything you need to know about bathroom floor tiles. Regardless of whether you’re renovating or building a new bathroom, today’s article will help you understand how to choose the right floor tiles for your space. Hopefully, when you’ve finished reading, you’ll take a more informed decision when purchasing bathroom floor tiles in Perth. Before you choose your bathroom floor tile, it’s a good idea to first understand the different types of floor tiles to determine which best fits your need. Ceramic floor tiles, also known as non-porcelain floor tiles are the most popular choice for bathrooms, kitchens and other moisture-prone areas. They are usually made out of white, red or brown clay that is kiln-fired and finished with a glazing material. Glazing makes the tile surface non-porous and dense, which in turn makes a ceramic tile stain-resistant, slip-resistant, and fire-resistant. Glazing also determines the pattern and colour of a ceramic tile and makes it easy to clean and maintain. Ceramic floor tiles are suitable for use in bathrooms that experience light to moderate traffic as they are relatively prone to chipping and wear. Modern ceramic tiles are available in a range of styles, designs and finish options, including matte, polished, satin, glossy and semi-polished. Porcelain floor tiles are another popular tile choice and can be used in indoor and outdoor flooring applications. Porcelain tiles are much harder and denser than ceramic tiles, which makes them more suitable for use in areas that experience high foot traffic. And unlike ceramic tiles, they usually carry the colour and pattern throughout the entire thickness of the tile. As with ceramic tiles, the surface of porcelain tiles is also hardwearing, resistant to scratches and stains. They are also very easy to clean and maintain. Porcelain tiles offer better stain and water resistance as compared to ceramic tiles but are usually more expensive as well. Natural stone tiles are yet another suitable tile choice for bathroom floors. Such tiles are made from natural stones such as limestone, marble, granite, travertine, and slate, among others. Natural stone tiles are available in a wide array of styles, colours, and patterns for you to choose. However, do note that natural stone tiles are porous and they are prone to absorbing water, stains, and lubricants. If you choose to go with these tiles, then you should make sure that the tile surface is properly sealed and make sure to maintain your tiles periodically. Doing so will keep them looking flawless, will prevent damages and stains and will ensure longevity. Also note, natural stone tiles are the most expensive flooring option of all types of floor tiles. Finally, mosaic tiles are another option that is quite popular with bathroom floors. Mosaics are an excellent choice for creating a unique feature in a bathroom. They are available in an endless array of styles, designs, colours, and patterns for you to choose. And regardless of whether you want to create a bold look or a simple and elegant look, you can easily find mosaic tiles that’ll suit your taste. Mosaic tiles are also very easy to clean and maintain. However, you should understand that mosaics will require more grouting than other floor tiles, which may mean more maintenance. Also, mosaic tiles tend to be slippery when wet. So, make sure to check the slip rating standards and the warranty offered on a mosaic tile before making a purchase. Bathroom floor tiles in Perth are available in many different sizes and shapes. You’ll need to consider the layout of your bathroom and the look you want to achieve in order to choose the right tile-size. Square bathroom floor tiles are the most common type, and they come in standard sizes of 300x300mm and 600x600mm. Square tiles are incredibly popular because they offer great uniformity and they are easy to work. They’re the perfect choice for creating a traditional, classic and neutral bathroom. Modern bathroom floor tiles are available in rectangular, hexagonal and other shapes for you to choose. While these tiles can help you create a unique look, working with irregularly shaped tiles means that you will need to be careful with your measurements. You should also consider hiring an experienced tiler to get a good finish. Apart from the tile type and shape, there are other considerations you should make before purchasing bathroom floor tiles in Perth. These include checking the slip and wear ratings of a tile. Because bathroom floors are wet areas, bathroom floor tiles are put through a slip wear rating test to assess frictional characteristics. The higher the slip wear rating of a tile, the better suited it is for use in heavy-duty applications. PEI Class 1 (absolutely no foot traffic): These tiles are recommended for wall use only. PEI Class 2 (light foot traffic): These tiles are recommended for bathroom floor and wall use. PEI Class 3 (light to moderate foot traffic): These tiles are recommended for walls, countertops, and floors that experience normal foot traffic. PEI Class 4 (moderate to heavy foot traffic): These tiles are recommended for use in residential and light commercial or institutional flooring applications. PEI Class 5 (heavy to extra heavy foot traffic): These tiles are recommended for use in heavy-duty commercial and institutional flooring applications. Always make sure to purchase floor tiles that are suitable for use in wet areas. The last thing you want to do is to choose floor tiles that do not offer appropriate slip resistance. Where to find high-quality bathroom floor tiles in Perth? When it comes to finding high-quality bathroom floor tiles in Perth at the best prices, look no further than Ross’s Discount Home Centre. We’re one of Perth’s largest stockists of tiles, and we offer an entire selection of ceramic, porcelain, natural stone and mosaic tiles for you to choose from. Our bathroom floor tiles are available in an unlimited array of colours, patterns, designs and style options. Whether you’re looking to create a modern, contemporary, classic or traditional look, you’ll find the perfect bathroom floor tiles in Perth with us. To help you get started, here are some bathroom floor tile recommendations from our range. If you’re looking to go with ceramic floor tiles, consider our Matang Light Bianco and our Celina Charcoal tiles which are bestsellers are our stores. Alternatively, for porcelain floor tiles, take a look at our Q-Stone Cappuccino or our Saturn Nero tiles, which are two of my personal favourites. For mosaic floor tiles in Perth, consider our Magnetic mosaic tile or our Gannicus mosaic tile, which are both designed for use in bathroom walls and floors. Finally, for natural stone tiles in Perth, choose from our Mink Grey or Lily Stone marble tiles, which are both excellent choices for your bathroom floors. Bathroom floor tiles play a very important role in defining the overall look and feel of your bathroom. If you are renovating or building a new bathroom, you must always choose your bathroom floor tiles with care. Bathroom floor tiles are available in many different types, including ceramic floor tiles, porcelain floor tiles, natural stone tiles, and mosaic floor tiles. Of these, ceramic and porcelain tiles are the most popular choices and they come in an array of styles, designs, and patterns. Mosaic tiles can be used to create a unique look and feel in a bathroom. Stone tiles can be used to create a natural, earthy feel but they are also the most expensive type of floor tiles. You should always take proper measurements and consider the size and shape of a tile before making a purchase. Also, pay attention to the slip wear ratings and always choose tiles that are appropriate for use in wet areas. And, when it comes to finding the best quality bathroom floor tiles in Perth at the most competitive prices, choose us at Ross’s Discount Home Centre. To take a look at our extensive selection of bathroom floor tiles, pay us a visit to Guildford or browse our online store today!